All Navajo baskets are made by using the coil method of weaving. The material is rhus trilobata, which is a fancy name for three-leaf sumac. The foundation for all designs is the Navajo ceremonial basket. This mystical ceremonial basket, with its wonderful curative powers in the hands of the medicine man, is still woven and used in traditional Navajo healing rites. In the late 1960’s, a few Navajo basket weavers experimented with other pictorial elements such as yei’i (Navajo gods) and eagles. As a result, Navajo basket artistry is experiencing an extraordinarily rich period of innovation. The innovator and prime weaving teacher is Mary Holiday Black. 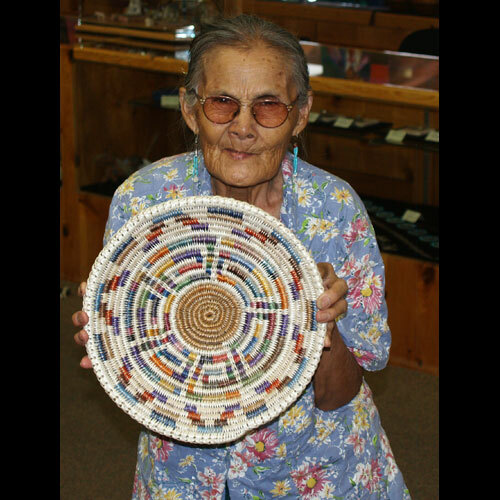 The work of younger fine basket artisans, such as Elsie Holiday, Lorraine Black, Alicia Nelson and Joann Johnson have exploded into a plethora of representational and geometric designs, making Navajo basketry one of the most exciting movements in contemporary Native American art. Actually, one of the most exciting movements in any art form. And it is right in our own Southwest backyard. Life is good!